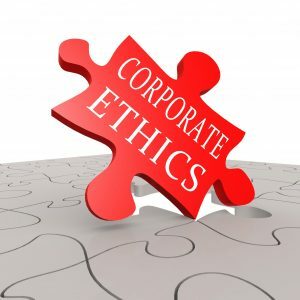 What Causes Poor Corporate Ethics? Demanding workloads which create high stress at work and at home. Top executive poor management practices. If unethical behaviour goes without consequence or you choose to promote these activities, it can lead to continuous and more eratic behaviour. Money is a high contender as to why someone may choose to undertake unethical behaviour, especially at the executive level. Avoiding tax payments is one of the common misconducts that are carried out by corporations which eventually lands them into major trouble. The main goal of any corporation is to drive through sales from customers to maintain a strong presence in the business world. Unfortunately, when a level of unethical behaviour starts to form, it can cause productivity levels to decrease which surround the person or corporation in question. When this happens, errors start to form in a once productive production line. This in turn can cause other employees to feel unmotivated resulting in a complete slowdown of the sale process that can lose you valuable time and money. In episodes where managers or leaders start to make unethical decisions, it can lead to employees losing a lot of respect for their bosses. When this occurs, it can be difficult for the leader to gain back the respect and trust that’s been lost. It also causes problems for them to run a successful business when their team feels as if they’re making poor corporate choices. Employees may also feel resentful towards their leaders. This is because, as a part of the company, they feel their reputation is also starting to fall apart along with the business’s reputation. When unethical behaviour occurs in a corporate setting, there’s a high chance it will be publicized. This in turn can cause your company to lose its credibility, resulting in customers abandoning sales with you, bad-mouthing your business, and not holding respect for you anymore. To gain credibility back a corporation needs to create a well-planned rebranding and marketing campaign, along with hiring a public relations team to help improve their reputation. This can lead to millions of dollars in costs, especially if you’re a well know and worldwide organization. In severe cases of unethical misconduct, it can lead to severe legal issues that result in loss of time, large fines, and other penalties with possible jail time. The cost of legal battles can go on for months to years and can lead into the millions of dollars depending on the corporation’s particular situation and level of unethical behaviour. In addition to this, executive who break the law can lead employees to also follow in pursuit in facing criminal charges. Select high quality people to add to your team that have a good reputation of work ethics in previous employment. Train people on good ethical behaviour by implementing training sessions on a yearly basis to maintain strong ethical behaviours. Maintaining strong ethical behaviour at a higher executive level to ensure employees maintain strong respect and good work ethics. Build a corporate culture that’s based on communication, openness, and transparency. Put controls in place such as progress audits to assess employees work efficiency and behaviour if complaints arise. Executives approve an employee to cut corners to complete a job on time against set guidelines. An executive takes money from the company on the side to use in his own agenda on the side. Employee takes a sick day when they aren’t actually sick to spend the day shopping or at the beach. Executives or employees engage in an affair with a CEO or married co-worker that’s associated with the company without ending their current relationship first. Employees clock in late or leave half an hour early before the working day is through. In any corporate environment, it’s important to maintain a high level of conduct and ethical behaviour to ensure the success of a company. By knowing the consequences of what unethical misconduct can do to your business, you can work on keeping a strong and positive presence within your corporation to limit this behaviour from happening. Have you made a plan to reduce the risk of a scandalous situation?